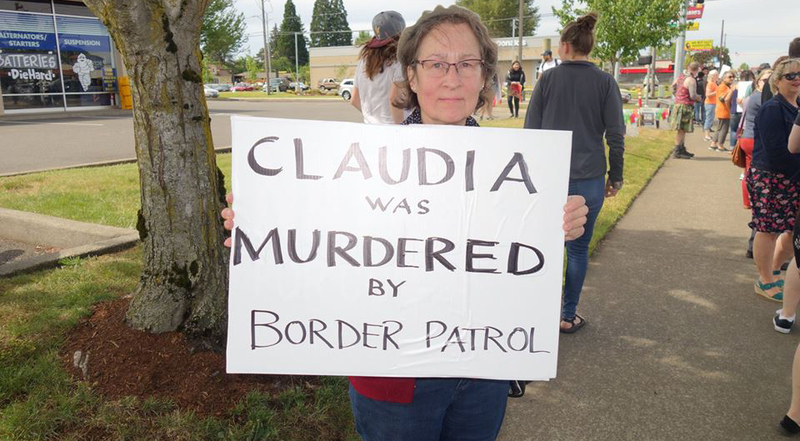 SALEM, Ore.—About 40 people turned out here for a public protest action called in response to the assassination of the 20-year-old Guatemalan woman Claudia Patricia Gómez González and ongoing harassment waged by the Border Patrol and ICE. Gómez was killed on the U.S.-Mexico border on May 23 by a Border Patrol agent. Her death has provoked a strong national reaction and protests in immigrant communities and by supporters of immigrant rights. The action was held on a busy street, near a mall frequented by immigrant and working-class people, and met with positive reaction from the public. 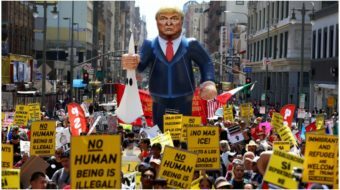 The crowd included past and present union officials, members of the Communist Party USA and Democratic Socialists of America, the American Friends Service Committee, DACA activists, members of the Racial Justice Organizing Committee, and many young people. The event was organized by the activist-oriented Latinos Unidos Siempre (LUS) and by a collective of immigrant rights activists who have been crisscrossing the state over the past year doing know-your-rights trainings and organizing among immigrants and supportive networks. The protest had an important activist component as participants were asked to call elected representatives and leave messages protesting the killing of Gómez and other abuses by ICE and the Border Patrol. Farmworker leader Ramón Ramírez updated the crowd on recent ICE actions and leaders of LUS educated everyone on the purpose of the event. Young people led spirited chants. The Salem event was one of several organized in the Portland-Salem-Hillsboro-Corvallis area. 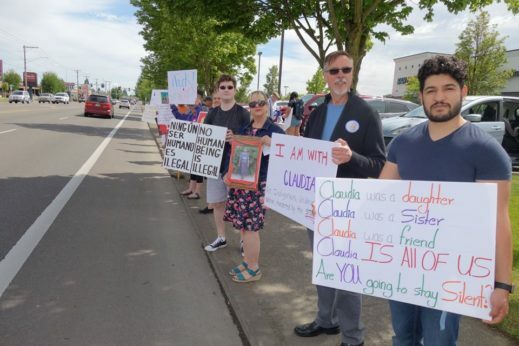 The Salem-Woodburn area was forecast to be a center for ICE enforcement more than a year ago, and only good organizing by the immigrant rights collective and strong community awareness has prevented that from becoming a reality so far. Nevertheless, there have been several dramatic ICE raids and traffic stops which have violated immigrant and worker rights. The Salem event also took place as Oregon Sen. Jeff Merkley was denied access to a privatized immigrant detention center and had the police called on him in Texas. Supporters of immigrant rights and anti-racists in Oregon are gearing up to stop the passage of a bill pushed by a hate group which aims at further restricting immigrant rights and ending non-cooperation between local police and immigration authorities. Immigrant rights and solidarity organizing has been underway in the Salem-Woodburn area for many years and is expanding as the vote on the anti-immigrant ballot measure draws near. 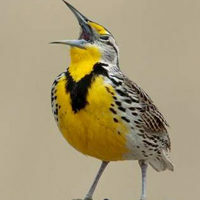 Bob Rossi is a long-time activist writing from Oregon.